Optional Activity: At five in the morning, smoke is beginning to rise from the village chimneys below you. The barking of dogs, startled by the balloon, attracts sleepy villagers outside to wave enthusiastically. The weird twisted landscape of corroded rock to which you have partially become accustomed from the ground level, becomes even more unearthly when viewed from several hundred feet above. A 90-minute hot air balloon flight culminating in a champagne breakfast on landing. In two words? Breathtaking and Unforgettable! We make a early start fort he stupendous funerary monument known as Nemrut Dagi, which was built for Antiochus I Epiphanes (69-38 BC), king of Commagene, and dedicated to his own glory and that of the gods. Despite Anticoshus’s overweening pretensions, or hubris, as the greeks would say, his kingdom was only a diminutive Roman client state, pushed up against the borders of the Parthian Empire. On our way to Nemrut Dag we will have time to visit a few other Commagenian sites, among them the tumulus of Karakus, which is framed by colomns and may contain the burial chamber of Antiochus’s wife, and the scant but evocative ruins of his capital city, Arsameia. None of this can prepare you for your sight of his last resting place, which is raised towards the heavens on the summit of a peak over 7000 feet high. At the center of the complex is the 164 feet high burial mound, surrounded on three sides by massive terraces. The north terrace is littered with fallen columns and was probably used as a place of assembly and as an arena for solemn processions. The east terrace is flanked by relief-portraits of his ancestors, while center stage is occupied by colossal, decapitated figures of Commagene’s syncretic, Greco-Iranian pantheon, not to mention Antiochus himself who is portrayed as of equal status. All their heads lie on the ground in front of them. These are the images you will have seen in countless tourist brochures, but a real encounter with them is still a shocking and astonishing experience. The astral symbols of the lion horoscope on the west terrace represent the deification and stellification of Antiochus Epiphanes (the God Made Manifest). This idea of the divine ruler was of Persian origin, and had a profound influence on Roman and Byzantine styles of autocracy, which, in turn, influenced all ideas of absolute rule down to Louis XIV and beyond. Though it may invoke divinity, there is nothing very spiritual about Nemrut Dag, which, in the final analysis, is simply dynastic propaganda on a vast scale, and a brutal assertion of power. There is an irony in this. Shortly after it was completed a dispute arose between Rome and Parthia. Antiochus took the Parthian side; the Romans won and Antiochus lost his throne. Nemrut Dag inevitably brings to mind Shelley’s Ozymandias: My name is Ozymandias, King of Kings, Look on my Works, ye Mighty, and despair. Overnight in Kahta. After breakfast we take a drive to Silifke. We visit Antakya Mosaic Museum which houses one of the best collections of Roman mosaics in the world; and St. Peter’s Grotto, the earliest Christian church ever built. Continue to Tarsus, the birth place of St. Paul, to see the St. Paul’s Well and Cleopatra Gate. It was also here where Marcus Anthony reputedly met Cleopatra. Overnight in Silifke. Early in the morning we set sail fort he enchanting region of islands, bays, promontories and inlets collectively known as Kekova. For many, this will be the highlight of the tour. Apart from being astonishingly beautiful, it is only place on earth where you look down the deck of a boat into the submerged houses, streets and churches of a Byzantine town. There will also be time for swimming, and visits to the charming villages of Kalekoy and Ucagiz. The former stands on the site of ancient Simena and is picturesquely situated on a high promontory capped by a crenellated Byzantine castle. Just below the castle is what may be the world’s smallest classical theatre, which is cut entirely from the living rock. The village is under a preservation order and any new construction (of which there is very little) has to be in traditional style. Ucagiz has an extensive Lycian necropolis to itse ast, and is set amid the ruins of the Byzantine town of Tristomon. Overnight in Gulet. Starting early, we cruise to Kas, a small, attractive town on a beautiful bay. It stands on the site of ancient Amthipellos, and a small but perfectly preserved theatre, the ruins of a temple and a number of impressive tombs can still be seen. The view from the theatre accross to the Greek island of Meis is particulary lovely. We sail on the former Greek fishing village of Kalkan from where we drive to Xanthos, one of the most important Lycian cities. Its rtuins stand on a hill high above the Xanthos River, and make a very striking impression. Not much is known of its early history, but since the city is mentioned in Homer’s Iliad it must date back to atleast the 8th century BC. The most remarkable thing about its later history is fact that the Xanthians twice burnt their city to the ground and committed mass-suicide when threatened with conquest, which suggested that they had a somewhat exaggerated attachment to their independence. On both occasions the city rapidly recovered, and today much remains to be seen, including a theatre, two agoras, two acropolises, city walls, a monastery, a Byzantine basilica with handsome floor mosaics, and, of course, many splendid Lycian tombs. Sadly, virtually all of these tombs were stripped of their remarkable relief sculptures by the English archeologist and adventurer Sir Charles Fellowes in 1842. We next move on the ruins of Patara, which lie only a short distance from Xanthos, and are on our way back to Kalkan. The city covers a vast area, surrounding a now silted up harbor. It is highly evocative and the ruins include a perfectly preserved triumphal arch, two monumental bath complexes, an elegant temple, a Hadrianic granary, several churches, a wide colonnaded Street, an exquisite theatre, and a truly enormous necropolis. But, for many people, the chief attraction of Patara is its glorious sand-beach, over ten miles long, which is one of the most pristine in Turkey, on which no construction has ever been allowed. In the evening we return to Kalkan. Overnight in Gulet. Our next destination is Gemiler Island, sailing along a dramatic and unspoilt stretch of coastline dominated by the majestic peak of Mount Cragus. Gemiler Island stands in a setting of quite extraordinary natural beauty, but that isn’t all it has to offer. The island’s landward side is completely covered with the ruins of the 6th century Byzantine town of Lebissos. There are churches, tombs, cisterns, houses, and fine mosaic floors, but the site’s most unusual feature is a long, vaulted Street (still showing traces of frescoes) that leads up to an eleborate ecclesiastical complex, which may have served as a centre of pilgrimage. From Gemiler Island we transfer to the mainland, and drive to remarkable Greek ghost-town of Kayakoy, which was abondoned in 1923 as a result of the “exchange of populations” between Turkey and Greece. There are three churches with frescoes (one of them medieval) and innumerable ruined houses, some of which are currently being restored. We spend the night anchored off Gemiler Island, once again dining beneath the stars. Overnight in Gulet. In Gocek we say goodbye to our crew and drive to attractive, riverside village of Dalyan. We board a riverboat and glide gently past rock-cut tombs with elegant temple facades, before winding our way through the narrow, reed-lined channels of the Dalyan Delta to ancient Caunos. The highly evocative ruins include a theatre, Hellenistic city walls, temples, a public fountain, and an unusually large and well-preserved Byzantine cathedral. 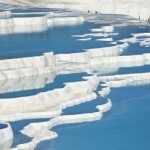 Then we drive to Pamukkale. Overnight in Pamukkale. After breakfast check out and take a drive to Izmir Airport. That gives best connection to your international flight. Boat Tours in Antalya to Fethiye. I travel to Istanbul nearly every year, and when I do, I bring between 12 and 22 high school students for a week of studying Ottoman History. For the last 2 years Kairos Travel has been my travel company. Flexible and helpful, Kairos Travel’s excellent customer service and unlimited knowledge help me to create a wonderful, experience for my students. Kairos Travel’s guides are the best in Istanbul. My students particularly love Atakan and Ogun. Last month, I added something to my yearly trip: Kairos Travel’s Night Photography Walk. We hit a home-run. Atakan took us to spots we didn’t know existed for some incredible night shots.